Rungta House, #65/A, Halls Road, Kilpauk, Chennai - 600010, Tamil Nadu, India. Raunaq Foundations is part of Group Raunaq, which includes diverse businesses that have been steeped in the tradition of focusing on quality and supreme customer service. The construction branch of Group Raunaq-the company is spearheaded by the vision of Mr. Raunaq Rungta. Various residential projects have been completed in and around Chennai, with a strong positive response towards the quality finishing, vibrant designs and functional living spaces. 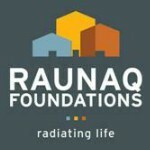 Of the firm belief that a Vaastu compliant home makes for a happy home - Raunaq Foundations ensures that every dream home built is as such!An almost obsessive opinion towards the security and safety of the customers has also made Raunaq Foundations use nothing but supreme materials that are ISO rated and have all the relevant test certificates ensured. The steel used is again as per the technical guidelines given by the best structural engineers in the business.Raunaq Foundations aims to create more value-for-money apartments that are delivered on time to clients looking for a transparent and stress free buying process.